With this being my first machine I wasn�t really too fussy about what it was and from which era as long as it wasn�t too technical for a beginner to get in there and repair, and that was a big question before I bought machine. With my arcade cab, it is running MAME on a PC, so if it breaks, I�ve fitted everything there is inside the cab myself so I know what it all is and what it all does. Had it been a machine I had refurbished and brought back to life and restored, then it would have been a different matter and a much steeper learning curve. That learning curve going from a video game to a pinball machine is much steeper again I think as there is much more to it and therefore much more to go wrong. If it broke or indeed wasn�t working when I got it, would I be able to fix it? Deciding that the answer was a definitive �perhaps� I bought one. Disco Fever was produced by Williams in June of 1978 and they made around 6,000 of them. The game, and the name, bear a striking resemblance to the film Saturday Night Fever but presumably for licensing reasons it isn�t officially based on the movie but the artwork is immediately indicative of the movie right down to the lady in red and the man in the white suit pointing upwards on the dance floor. The table was designed by Tony Kramer with art work by Christian Marche (who apparently had the movie poster in front of him) and it was the fourth Solid State game produced by Williams and the second to feature electronic sound. As the name System 3 would suggest, this game was built around the 3rd generation of the Williams hardware and software system that managed and controlled the games. There is a ton of help out there online if you know exactly what you are looking for so you need to know what your game is and what runs it. Williams System 1 was basically a prototype machine made from a converted EM game called Grand Prix in 1976 and only one or two of them were made. System 2 was again a conversion of an EM game, this time Aztec, again in 1976 and less than ten were produced. System 3 came around in 1977 and the games that used it were Hot Tip (also available as an EM game), Lucky Seven, World Cup, Contact and Disco Fever. Williams had as many as 10 different evolutions based around the same system, and a game with a long run such as Flash was initially a System 4 game but was still in production when System 6 was being used and some of them shipped as System 6 games, though no known games were based on System 5. System 6 also ran the other game with curved flipper, Time Warp in 1979 as well as the first ever talking pinball machine, Gorgar. In fact all Williams Solid State games from the 1977 Hot Tip to the 1984 Star Light shared the same basic board design, and that is the boards that I had to fix. I started off by assembling the table first by bolting the back box onto the cabinet, and once it�s physically attached with the bolts there are all of the connectors that link the playfield to the circuits in the back box and also a grounding strip. 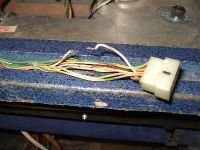 Williams connectors are coloured and shaped so that they can�t be connected incorrectly but it�s a good idea to double check the colours of the wires that are going together as you connect them all up. There are a pair of white connectors and a pair of black connectors that are physically identical and you must get those the right way round otherwise you�ll send the 28 volt solenoid voltage down the 5 volt logic circuit and fry a bunch of chips on the cpu and driver boards. Like I said, also look and check that the colours of the wires going together matches as it has been known for machines to be sold with connectors of different colours going together. If that was all they had on the production line at the time and that machine needed to go out then the chances are that they would use what they had, so double check that the wires are the same. 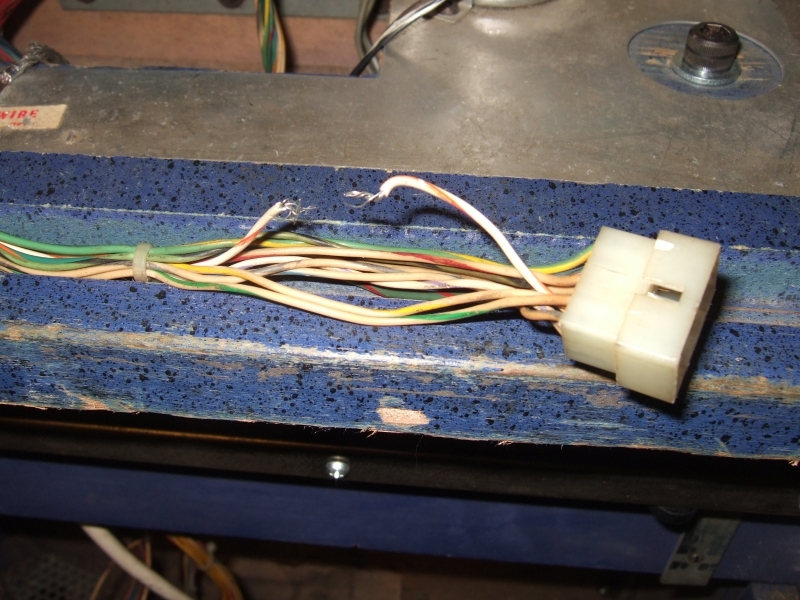 While I was doing this I noticed a couple of frayed and broken wires that I fixed straight away, and once I�d done them I did a quick visual check of the whole machine to see if there were any obviously broken or stray wires anywhere else. Once I was happy with that I put away the backglass and the playfield glass so they didn�t get in my way or get broken while I was doing any repairs, and I flipped up the playfield to look at the workings of it underneath. Oh my word! There a few words that can convey the impact that doing that has on somebody about to repair a pinball machine. This was literally and figuratively a whole new ball game, it was my first glimpse of the learning curve that lay ahead of me. There was no way I could get my head around this thing and fix and maintain it was there? We�ll see. Probably the most famous (or infamous depending on your point of view) feature of Disco Fever were its "banana flippers". Only two Williams games were ever produced with these bent flippers, Disco Fever and Time Warp.